On Tuesday, 17 October 2017, GOInternational officially launched their Indo-Finnish Market Entry Acceleration programme with a beautiful evening do that befitted the occasion. 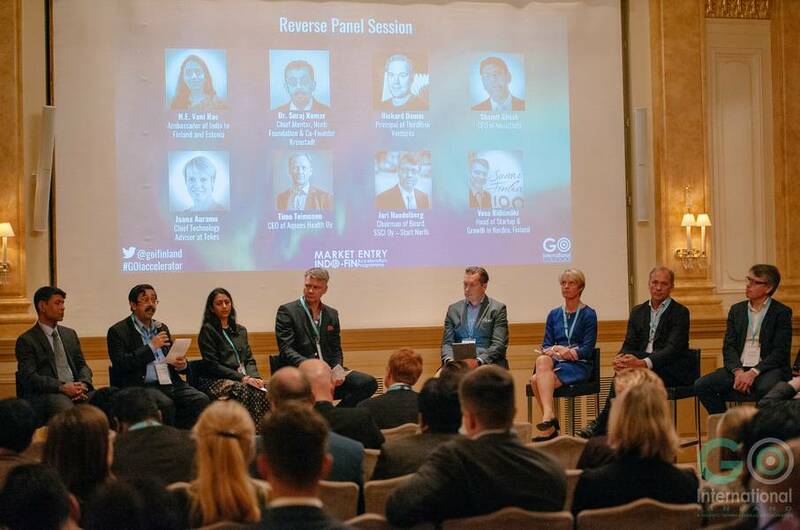 Delegates and guests, all key ecosystem players, congregated in the stunningly beautiful Mirror Room inside Helsinki’s opulent Hotel Kämp, to receive a glass of wine and a warm welcome to the evening by GOInternational’s CEO, Mr. Mohammad Shabbir. Mr. Shabbir set the scene by recounting India’s impressive story, as one of the world’s fastest growing emerging market economies. With the launch of Narendra Modi’s $15B Smart Cities Mission, mass urbanization is introducing new challenges in providing enhanced quality, performance and interactivity of services for its 356 million youth population. The rapid transformation and growth, enabled by technology & innovation is creating unique opportunities for the Finnish and the wider Nordic innovation ecosystem. The knowledge, technology and skill sets of Finnish and Nordic companies can not only contribute to India’s transformation; but can also create opportunities for co-creation and collaboration with the Indian ecosystem in order to enkindle global markets for Nordic solutions. 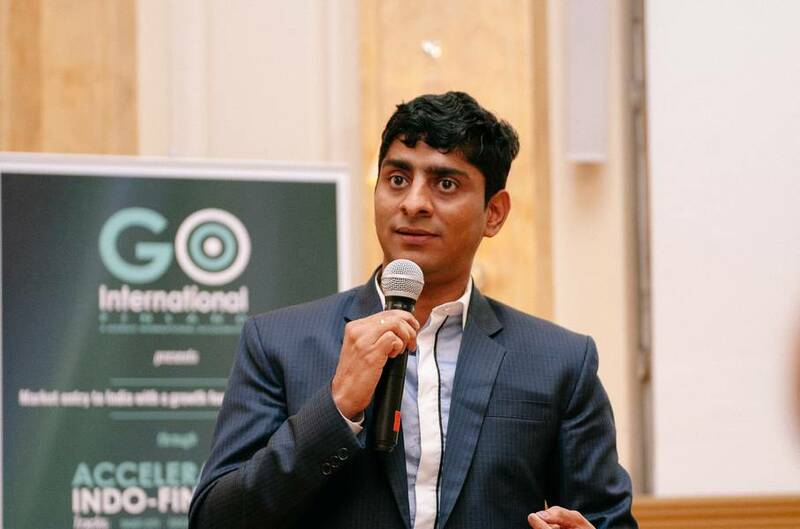 In response to this, Shabbir revealed that GOInternational is harnessing these challenges, together with Indian counterparts, utilising Finnish know-how through GOInternational’s Market Entry Indo-Fin Acceleration Programme for Series-A Start-ups, SMEs and Corporations. H.E Vani Rao’s speech was succeeded by a Reverse Panel session, whereby members of the panel discussed the lateral, supranational opportunities to collaborate and co-create Smart City, Health Tech and Education Innovation projects. Ecosystem players, solution seekers and solution providers in the room deep dived into specific projects and learned how to participate in the Acceleration Programme. Stepping up to the rostrum to join the Ambassador, were; Dr. Suraj Kumar (Chief Mentor, Neeti Foundation & Co-Founder Kronstadt), Rickard Damm (Principal of ThirdRisk Ventures), Shamit Ghosh (CEO of Noise2Info), Jaana Auramo (Chief Technology Adviser at Tekes), Timo Teimonen (CEO of Aqsens Health Oy), Jari Handelberg (Chairman of Board, SSCI Oy – Start North) and Vesa Riihimäki (Head of Startup & Growth in Nordea, Finland). Bringing the agenda to a close with a very poignant talk about understanding the fundamental necessities that will help a corporation to transition from a €million domestic firm to a €billion multi-national, Head of Strategic Marketing at Tieto, Mr. Raghunath Koduvayur, discussed change management and the need for structure and processes. The evening drew to a relaxing close with informal conversation over wine and light refreshments. Feel like you missed out on a great night? JOIN US for the next phase of the Indo-Finnish Market Entry Acceleration Programme! BY JOINING US FOR OUR SMART CITY BIZHACK INDIA! SMART CITY BIZHACK INDIA is the first Indian-themed side-event at SLUSH, which is 100% dedicated to unveiling the vast opportunities in the Indian market for Smart City Innovation. 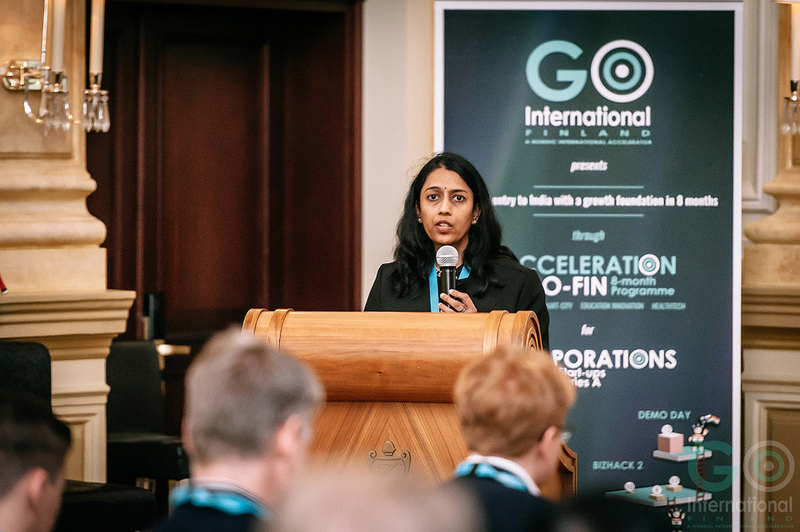 GOInternational’s three day event will offer Series A Start ups and SMEs a bridge to access live marketplace opportunities for conducting business in India. Subscribe to get the latest news on the Market Entry Programme!